Larson Electronics’ Magnalight.com has announced the addition of a heavy duty quad-pod mounted work area light designed for portability and reliable operation in demanding work environments. The WAL-QP-2X-25 portable light tower features dual quartz halogen lamps, rugged steel construction, height adjustability, and multiple power configuration options for use with normal standard voltages as well as 12 and 24 volt DC power sources. The portability and power options of this unit make it ideal for commercial and industrial applications where easy deployment and the ability to utilize either standard or low voltage is needed. The WAL-QP-2X-25 quad-pod mounted work area light from Magnalight.com provides reliable illumination and the versatility of multiple power options and portability. Designed to withstand rugged use in demanding work environments, this portable work area light tower is constructed of heavy duty steel and equipped with dual quartz halogen lamps. This work area light is designed to provide versatile portability with an adjustable mast that can be raised to 14 feet and lowered to 7 feet, four collapsible quad-pod legs that can be folded up for transport, and a removable light head. The compact and easy take down design of this unit allows operators to quickly and easily deploy the unit or break it down for transport in a matter of minutes. The four leg quad-pod design provides excellent stability, even under windy conditions. This compact design also provides the benefit of allowing Magnalight to avoid pallet freight shipping charges by shipping the units via UPS and passing the savings along to customers. Magnalight includes a set of solid wheels mounted to the base of this light tower which allows users to simply tilt the unit back and then roll it from one location to another once fully deployed. The dual halogen light heads on this unit provide 17,500 lumens and are capable of illuminating an area 6,400 square feet in size. Each light head is independently adjustable and can be adjusted both vertically and horizontally for maximum coverage of the work area. 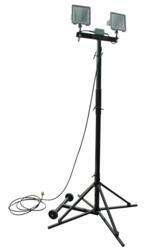 In standard configuration this portable work light is set up to operate with common 120 VAC electrical current. Other power options include 12 volts DC with 150 watt lamps and 24 volts DC with 300 watt lamps for those requiring a unit operating at low voltages. 25 feet of included SOOW cord is included along with a standard 1447 5-15 straight blade plug for easy connection to most standard outlets. This portable work light is built to be easily deployed and requires no tools for setup or take down, allowing operators to quickly deploy or transport the light with a minimum of setup and breakdown time. 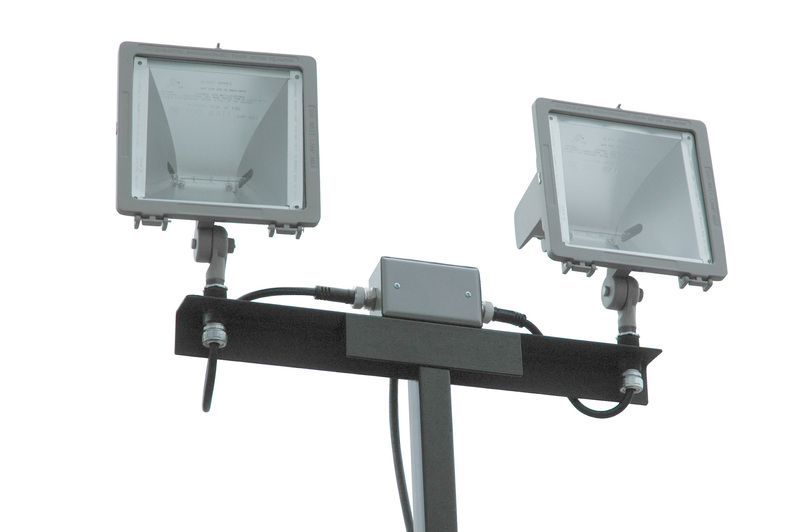 The heavy duty construction and use of halogen lights in this towers design assures long lasting performance and economical lamp replacements, making it ideal for industrial locations, commercial applications, law enforcement, and anywhere rugged and effective illumination that can be quickly deployed is needed. Larson Electronics’ Magnalight offers a wide selection of light towers, work area lights, explosion proof LED lights, HID work lights, explosion proof lights, and powerful yet portable lighting solutions. Visit Magnalight.com to learn more or call them at 1-800-369-6671 or 1-214-616-6180 for international inquiries.